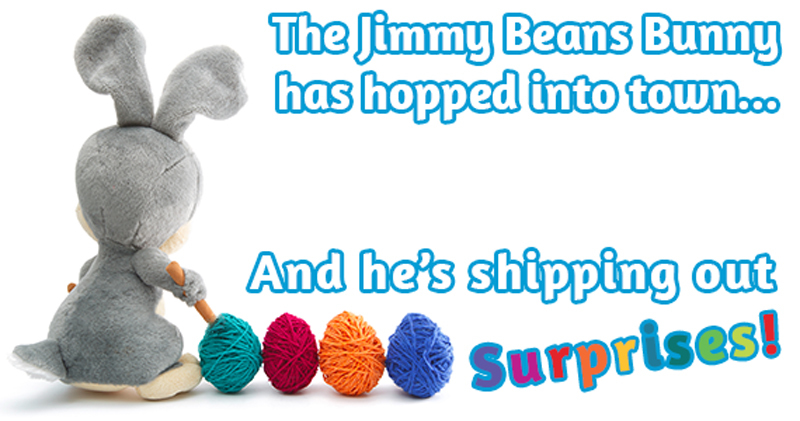 PROMOTION DESCRIPTION: The Jimmy Beans Bunny Sweepstakes begins on March 25, 2019 at 1:30PM (PST) and ends on April 18, 2019 at 11:59PM (PST). ELIGIBILITY: Open to legal residents in the United States who are 18 and over. Any employee of Jimmy Beans Wool or their Immediate Family, are ineligible to enter the Sweepstakes or win a prize. This Sweepstakes is subject to all applicable federal, state and local laws and regulations. Only one stitch marker prize per person will be awarded. Only one $100 Gift Certificate to Jimmy Beans Wool will be rewarded randomly in a customer order. Only one $100 Gift Certificate will be awarded randomly to entrants who share a photo and tag #JimmyBeansBunny on Instagram from March 25, 2019 at 1:30 PM until April 18, 2019 at 11:59 PM (PST). Gift cards and gift certificates are subject to the terms and conditions of the issuer. Prizes cannot be transferred, redeemed for cash or substituted by winner. Sponsor will not replace any lost or stolen prize items. This Sweepstakes is open to legal residents of the United States and Prize(s) will only be awarded and/or delivered to addresses within said locations. All federal, state and/or local taxes, fees, and surcharges are the sole responsibility of the prize winner. HOW TO ENTER: I. All purchases made on JimmyBeansWool.com between March 25, 2019 at 1:30PM through April 12, 2019 at 11:59PM (PST) are eligible to win a stitch marker and one grand prize of $100 Gift Certificate to Jimmy Beans Wool. Limit one entry per customer. II. Entrants who receive a stitch marker and share a photo of their prize to Instagram with the hashtag #JimmyBeansBunny are eligible for a Grand Prize $100 Gift Certificate selected at random. Limit one entry per customer. Entrants may also enter through mail by sending their name and address to ATTN: Jimmy Beans Bunny Sweepstakes, 4850 Joule St. Ste A1, Reno NV 89502. Limit one entry per customer. WINNER SELECTION: All Winner(s) of the Sweepstakes will be selected at random. WINNER NOTIFICATION: I. Randomly selected 1000 winners will receive a stitch marker in their order. II. One randomly selected winner will receive $100 Gift Certificate to Jimmy Beans Wool in their order. III. One randomly selected winner who shares their sample photo and hashtags #JimmyBeansBunny will win $100 Gift Certificate to Jimmy Beans Wool. Jimmy Beans Wool is not responsible for any delay or failure to receive prize. LIMITATION OF LIABILITY: Jimmy Beans Wool assumes no responsibility or liability for (a) any incorrect or inaccurate entry information, or for any faulty or failed electronic data transmissions; (b) any delivery difficulties or packages not received. If, for any reason, the Sweepstakes is not capable of running as planned for any reason, Jimmy Beans Wool reserves the right at its sole discretion to cancel, terminate, modify or suspend the Sweepstakes in whole or in part. In such event, Jimmy Beans Wool shall immediately suspend all drawings and prize awards, and reserves the right to award any remaining prizes in a manner deemed fair and equitable by the Sponsor, Jimmy Beans Wool. SOCIAL NETWORK DISCLAIMER: This promotion is in no way sponsored, endorsed or administered by, or associated with Instagram or its parent company, Facebook. You understand that you are providing your information to the Sponsor, Jimmy Beans Wool and not to Instagram or its parent company, Facebook. WINNER LIST/OFFICIAL RULES: To obtain a copy of the Winner List or a copy of these Official Rules, send your request along with a stamped, self-addressed envelope to ATTN: Jimmy Beans Bunny Sweepstakes, 4850 Joule St. Ste A1, Reno NV 89502. Requests for the names of the winners must be received no later than one month after the Promotion Period has ended. For accessing a Winner List online, visit https://www.jimmybeanswool.com/newslettersHome.asp. The winner list will be posted on April 19th, 2019 in the Jimmy Beans Wool weekly newsletter.